Sprung über den Springbrunnen des Caesars Palace. Bei dem Sprung verlor Knievel vor 50 Jahren fast sein Leben. 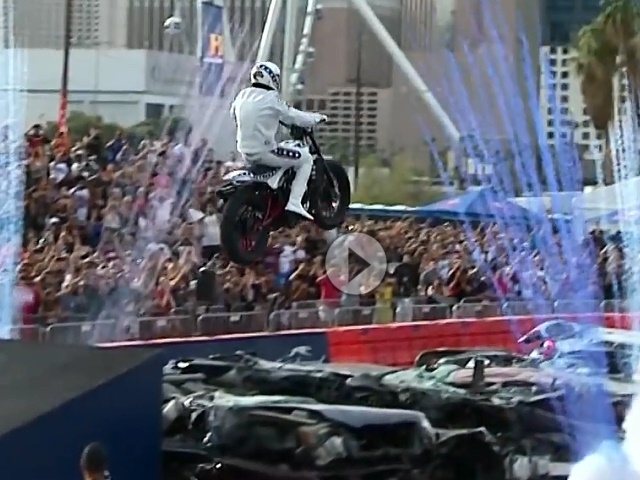 Evel Live, an unprecedented three-hour event premiering Sunday, July 8, at 8 pm ET / 5 pm PT on HISTORY®, produced in partnership with Nitro Circus, will see Travis Pastrana pay tribute to Evel Knievel by attempting to exceed three of Evel’s most iconic jumps. Travis will look to surpass Evel’s 50 crushed car record as well as beat his 14 bus record by jumping 16 Greyhound buses. Then Travis will cap the night off by attempting to complete the famous Caesars Palace fountain jump that 50 years ago left Knievel grasping for his life. Raising the stakes even more, Travis will attempt these jumps on a v-twin motorcycle similar to what Evel used. He will be jumping a modern-day evolution of the flat-track motorcycles of the past, the Indian Scout FTR750.